For those who have been to a busy bar and have had to wait… (and for those bartenders, managers, & owners who want to make more money). When it comes to going out for a night on the town, we all appreciate spending a little less time waiting in line for a drink. And when I do go out, I’m usually disappointed by the lack of efficiency displayed by most bartenders. As an operator, I am always looking for more ways to raise sales, and wow guests. There is a fundamental way most bars operate that slows the flow of alcohol, money and tips. I recognize that there are times when a bar should slow the flow of inebriates. This blog post is not relevant for those times. In the movie Cocktail, we see Tom Cruise as a great showman flipping bottles and dazzling his massive crowds. But, wow, they must be thirsty! Cool bar tricks are great. 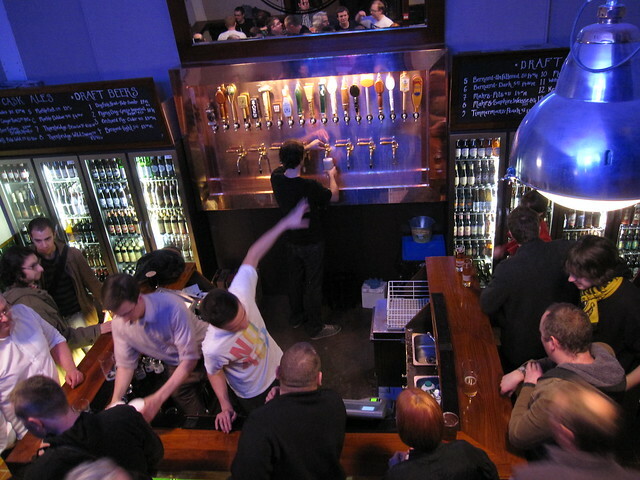 What’s better is a busy bar that is operating in a profitable manner. There is a brewery in my neighborhood that I go to on occasion. They have a great line of beers and a fine atmosphere. Service? Unfortunately, their service isn’t what keeps me coming back. It’s fine with me if a bartender wants to display a tinge of arrogance (many do). But, please, don’t make me wait in line for lack of talent at the same time. Lets dissect the normal bar exchange. First, the bartender asks what the guest would like. Second, they go make/pour what that guest ordered. Third, they bring the libations to the guest. Fourth, they go ring the drinks up, then explain the amount due. Then the guest pulls out their wallet, and finds their money while the bartender watches them. Finally, the bartender transacts the payment. That’s a lot of steps for the next guest to watch and wait for. By this time, some other guy is already making moves on the girl I was fetching a drink for and the line isn’t getting any shorter. A club as busy as those seen in Cocktail has to be faster. But how? The drink pricing must be set to include tax. There shouldn’t be any pennies, nickels or dimes used for alcohol. Dollars and quarters are enough. The trick to fast bar-tending is having good memory. The bartender needs to memorize common drink prices. Again, those drink prices must be made so that they are easy to remember. Once the bartender has a firm grip on drink prices; we can pick up the pace. Here’s how: First, when the drink order is taken, tell the price right then. This is important because many people don’t have their money out until they know what is owed. Why do people do this? They just do. Second, move to the next guest, take their order, give a price and continue taking orders and giving prices until you can’t remember any more. It is very common to be able to remember two to four people’s drink orders. Third, make and serve the drinks. Finally, process the payments and start the cycle anew. At this point, the bartender is essentially waiting on at least twice as many people at once and combining many steps. This practice will increase bar sales significantly while expediting customer service and lining the bartender’s pockets to-boot. Obviously, as alcohol sales are increased, some precautions must be taken to monitor the amount of drinks people have had and their inebriation levels. Please serve responsibly. Posted in Bar, Front of House, Guest Ordering, How To, Management, Profitability, Restaurant, Service.